Does the hand that rocks the cradle rule the world? Infant formula, artificial milk for feeding to babies, might seem an unlikely issue for a major international trade dispute. 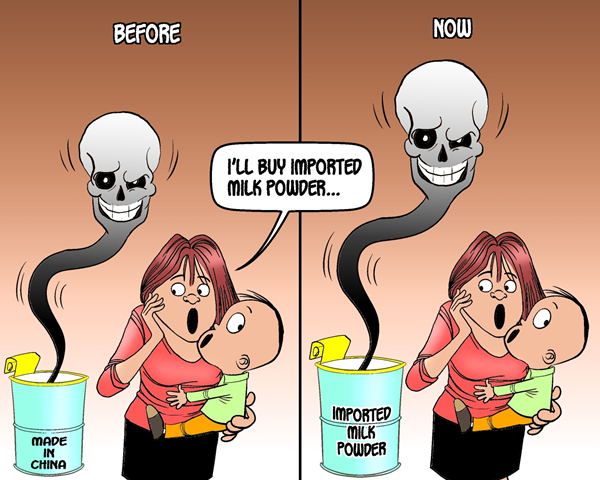 But it is, of course, a hugely sensitive topic among the general public; threats to a baby's health are something which no parent will take lightly, and a health panic over baby formula can have a real impact on trade. The recent scandal over the discovery of bacteria which might cause fatal botulism infections, in milk formula produced by the giant New Zealand dairy company Fonterra, has demonstrated this very clearly. The scandal has been a disaster for Fonterra's business in China, which has grown hugely in recent years with the growth of the market for dairy produce, on which China now spends $12.7bn per year. The growth in demand for dairy products is an interesting spin-off from China's rapid growth and increasing integration in global markets; before the reform and opening up era dairy products were not widely consumed in China and were regarded as a Western peculiarity. Now the Chinese have acquired a taste for milk, ice-cream, cheese and such Western imports as pizza. At the same time, the expansion of the Chinese economy has drawn tens of millions of women into the workplace. China is one of the leading countries in the world for equal opportunities, particularly in the cities; nearly all women expect to work rather than be stay-at-home housewives, which raises the question of what happens to their babies. They can't be breast-fed any more, or not for any length of time. In any case, breast-feeding is out of date in the modern world, it's what the peasantry do, hence the requirement for huge quantities of baby formula. This is where the health crises occur. There was a huge one in 2008-2009, when traces of melamine were found in baby formula produced by the San Lu Company, and six small children died. This caused a loss of faith in domestic products, which boosted the sales of overseas formula producers, especially in Australia and New Zealand. Now the situation has been reversed, as now it is the New Zealand producer Fonterra which has had to own up to the discovery of the clostridium bacterium in its products. Either way, Chinese parents are feeling vulnerable and inclined to panic. Fonterra are trying to bring a bit of reason back into the debate, before their brand is fatally affected. Soon after the scandal broke, Fonterra's CEO Theo Spierings came to Beijing to apologize to the Chinese people, and do his best to reassure them that Fonterra was doing everything it could to resolve the situation. New Zealand, geographically very remote from the mainstreams of global trade, values its reputation for reliability and fair dealing, and will no doubt soon restore it. But this affair shows how very easily one small failure in checking and monitoring products for export can lead to a massive problem. No country has a perfect inspection regime, but all countries must work to ensure that flaws in the regime are fully addressed, and that any incentives for circumventing safety regulations are eliminated. However, we have once again seen that problems in the global trading system are best addressed peacefully and constructively rather than through confrontation. Fonterra sent their CEO straight to China to apologize unequivocally to the Chinese people affected. The Chinese government, far from condemning the New Zealanders and making a nationalistic appeal to buy Chinese products, took a measured approach and announced their readiness to address the issue in the best interests of all concerned, ensuring that in the future the interaction between China and foreign companies will focus on safety, fairness and genuine cooperation. This is the way to go. A recent safety scandal in baby milk formula from New Zealand reminds us of how issues in the global trade system should be resolved.